This edition is a Coronet Books General Fiction edition, published in 1984, by Hodder and Stoughton Limited of Great Britain. The original copyright for the story is 1956. The story is available in different editions and formats. This volume was an international version, having a front cover price of $3.95, and a back cover price of £1.75, and was obtained from an Amazon bookseller's shop. "Long before Squire Trelawney and Doctor Livesey died, Ben and I were on terms of great intimacy. Because I was the one who first located him he always reserved for me, man and boy, a warm corner of his heart. He would tell me stories out of the past that could never have been wrung from him by the Squire or Doctor, and I, for my part, do not betray his trust by passing them on, having obtained his permission to set them down after his death." Hawkins goes on to say that it would be impossible to tell the story in anything other than the first person, and that he organized the stories that Ben had told him, into a narrative. The story tells how Ben met Nick Allardyce, son of a local parson, and how the two of them fled after the death of a local land owner. Nick wanted an adventurous life and had dropped out of medical school, but had enough training to be appointed surgeon on a transport ship, taking prisoners to the Carolinas to work on the plantations. That ship was the Walrus, later to become Captain Flint's pirate ship. How Nick and Ben met John Silver and others from Treasure Island forms the basis of this story. We learn where the fortune buried in Treasure Island came from, how John Silver lost his leg, and how Nick ended up being the pointing skeleton discovered by the treasure hunting party at the conclusion of Treasure Island. We also learn how Ben came to be marooned on the island years after he had fled the Walrus and obtained honest work. The book concludes with another note from Jim in 1811, in which he discloses one last surprise concerning a survivor from the old days. The story is extremely well written and entertaining, as it should be considering whom its author is. Ronald Frederick Delderfield, who died in June 1972, was a popular English novelist, many of whose works have been adapted for television and are still widely read. He was the author of such popular works as To Serve them All my Days, God is an Englishman, and the trilogy of A Horseman Riding By. 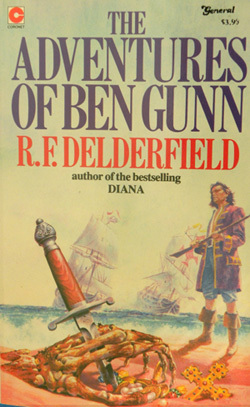 I read his later books in the 1970's and 1980's, little suspecting that Delderfield had written The Adventures of Ben Gunn. I first read it in the early 1960's, and although I enjoyed it, I forgot its name and author, but never forgot what a good yarn it was. A recent reference on Tarboard led me to the Wikipedia page on Treasure Island, and from it, I was able to discover the name and author of this long remembered book from my youth. The Adventures of Ben Gunn is a very well written and believable account of the years before the story in Stevenson's Treasure Island takes place. Delderfield has done his research too, and it shows. He states how Israel Hand was indeed Blackbeard's gunner who had not died with him, because he was not aboard, having earlier been injured by one of Blackbeard's random acts of cruelty. Also, Silver's pirate past is nicely dealt with. When he comes on board the Walrus, sole survivor of a fire at sea, he shows Nick and Ben his "Woodes Rodgers", the name given to the pardons that Rodgers and others had instituted in New Providence and Jamaica in an effort to reduce piracy. The paperback edition is also illustrated in a dark woodcut print style, presumably from the hardcover edition, but credit is not given to the artist. The book is very well written, and tells a very plausible story. I heartily recommend it for anyone who, like Delderfield's children whose questions inspired this book, wants to know the how and why of Treasure Island's events and characters. Delderfield's introduction speaks to that and concludes, "This book therefore is not a sequel to Treasure Island and not, I most earnestly hope, a bad imitation of it. It is more of a supplement and one, I feel, of which Stevenson might have approved." What the story does not tell is what eventually happened to John Silver. But there are at least 3 novels titled Return to Treasure Island that I have on order, and I will report later on how successfully they take up the later tale. I have also learned of another prequel , titled Long John Silver, written by Björn Larsson, and translated by Tom Geddes from the original Swedish. In the words of Alan Robson, its reviewer, Delderfield's story "... is quite different from Larsson's tale, though some of the characters and incidents are common to the two. The books complement each other to an enormous extent." >Sigh< Yet another book to pursue! This article is ©2009 by Claire Barnett, and posted on All Things Ransome with permission.